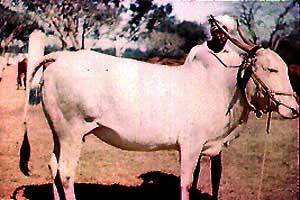 The Hallikar is a Bos indicus breed selected primarily for draft purposes and are of the Mysore type of zebu cattle. Considered one of the premier draft breeds in India they are often raised by families who have specialized in production of Hallikar draft animals for hundreds of years. It is not unusual for a cow to be brought 100 miles to mated with a bull from these breeders. They are found primarily in the southern region of Karnataka state, in the area surrounding Mysore, in the bottom of the Indian peninsula. In addition to normal draft uses the breed is also used for cart racing. Once trained, a team of Hallikar oxen can pull a loaded cart over rough roads at a rate of 40 miles per day. The typical color is dark grey. The Hallikar are the origin of the Amritmahal breed. Genus Bos: Cattle Breeds of the World, 1985, MSO-AGVET (Merck & Co., Inc.), Rahway, N.J.
Mason, I.L. 1996. A World Dictionary of Livestock Breeds, Types and Varieties. Fourth Edition. C.A.B International. 273 pp.